Michele Chapin has been a working California artist for the past 30+ years. She studied drawing, printmaking, jewelry design, bronze, clay and metal sculpting, art history and psychology at the University of California, Santa Cruz. A founding member of the Santa Cruz Art Center, she apprenticed there with several artists. Later moving to San Francisco, she worked as a professional clothing designer for several years. In 1987, Ms. Chapin relocated to Ventura's Art City and began a stone carving apprenticeship with sculptors Paul Lindhard and Joanne Duby. She also collaborated with muralist and painter Mary Beth Hanrahan, as an Artist In The Classroom, creating numerous local projects supported by public and private fellowship grants. 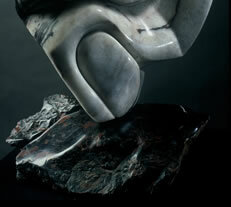 Ms. Chapin quarries and collects many of the rare and unique rocks used in her work from Southern California's deserts. Her sculptures are inspired largely by the human figure. She creates stone sculptures for both interiors and exteriors as well as large functional pieces incorporating unusual tones, exotic colors and natural textures. Her sculpture "Desert Flower", is on permanent display at Ventura City Hall. It was an inaugural purchase of the Ventura Municipal Art Collection. Ms. Chapin's water sculptures feature free-floating stone spheres rotating on a film of water. They have been centerpieces for the Ventura County Symphony Orchestra's annual Design House. She executed and installed a monumental granite sphere fountain commissioned by US Sales Corporation in Moorpark. She received a "Best of Show" award at Art In The Park during the 1997 Ojai Music Festival. Her Fountain Sculptures have twice been selected as "People's Choice" winners at the Golden State Sculpture Competition and "Best of Show" in the 1994, 1995 and 1998 Ventura County Fairs. Ms. Chapin was named as a rising star by the Ventura County Reporter newspaper in their "Who to Watch in 2001" issue. During that year she exhibited a series of black and white sculptures funded by an Artist's Fellowship Grant from the city of Ventura. She has also received two 2002 Artist's Fellowship Grants. Currently she is completing a 6,000 lb. marble sculpture commissioned by Communications and Power Engineering in Camarillo, California. At present, Ms. Chapin works as a stone sculptor on public and private commissions at Stoneworks Studion in Ventura, California where she is also a vocal arts activist. 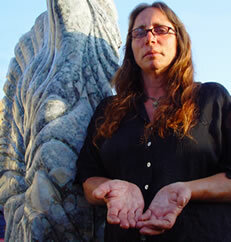 She teaches stone sculpture classes in her studio to Youth At Risk and private clients. Her studio, garden, and gallery are regularly featured by the City of Ventura Office of Cultural Affairs as a "Best Bet" during city sponsored Artwalks, and she conducts several yearly guided tours and lectures. During studio tours, gallery openings, and Artwalks she features up to 40 artists, poets, and musicians of all ages in her studio and garden. Thousands of children and adults visit the studio yearly, providing the public and working artists opportunity to interact.